The road season underway at round one of the Abingdon Race Team Winter Series on the airfield at Dalton Barracks yesterday morning. The cold and rain made for a memorably experience, particularly for the pair of riders riding their first races. In the men’s 3rd category race Michael Knight and Matt Kerin showed their strength in taking first and second place, comfortably ahead of the chasing bunch. In spite of their plans to wait for the sprint, Michael made a move after about 40 minutes of racing and got clear with Matt on his wheel. No one else was able to follow and the two settled into the task of building a 2 rider break. 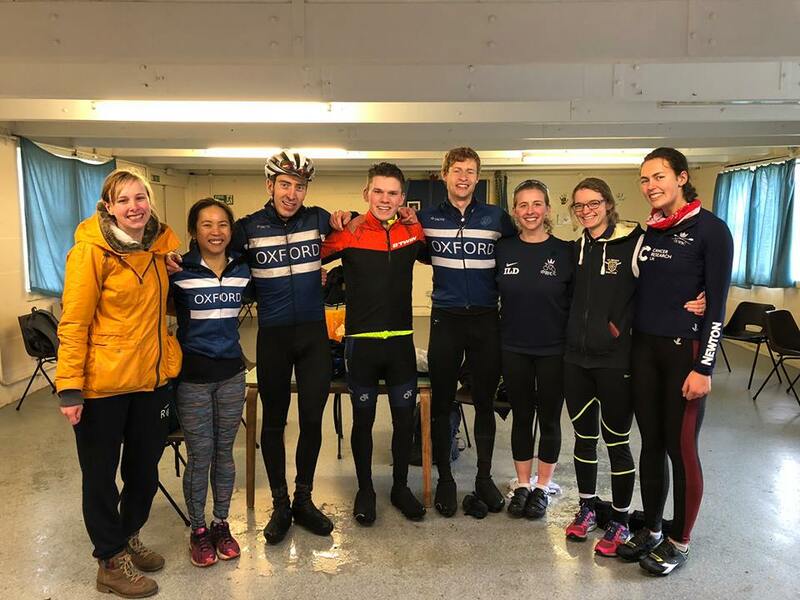 By the end of the race, the pair of Oxford riders had amassed a sizable lead and were able to enjoy the final glorious (if damp) minutes. In the women’s race we rode aggressively and tried to ignite the race. In particular, Becca Kearney made several good moves and the pair of Cyndi Goh and Rebecca te Water Naudé made a big attack in the final stages but unfortunately weren’t able to hold on to the line. The riding of Becca and Issy Dodds was partiularly impressive given this was their first bike race – there is certainly more to come from these two. Tamara, the club’s resident 1st category racer, opted to ride in the men’s E12 race (the women’s race was limited to 234 riders). This was described as “savage” but was no doubt great training. OUCC also featured in the men’s 4th category race. Unfortunately we were blighted by punctures but Mat Veal was particularly acting, shutting down moves and getting well positioned for the sprint. We look forward to round 2 next weekend.